March is always a busy start to our season, which is great after three months of lying low. It was with much sadness that I was not able to make Santa Cruz Surf Fest. Kristin said if I go to SC, she's going to Egypt. Too bad because the waves were really going off this year and the surfing was extreme, but we made up for it with some brisk business here at SC&K. We shipped a boat to Pedro down in Argentina. It took some doing but we now have good friends in Buenes Aires eager for us to visit..
Monday we had our first surf class of the season over at Folly Beach S.C in small but very clean conditions. Half way through the lesson I realized my boat was sinking. 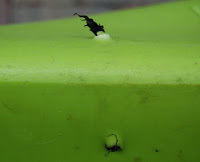 After close inspection I noticed a bullet hole that passed through the hull and out just above the forward rail. It explained the automatic gun fire I heard three nights before and got me wondering how many more boats lay slain back at the ranch. Our first camping trip went down to Beach Hammock Tuesday and Wednesday with ten students from Lawrence Uni in WI. It was a great trip which means good weather, good food and good company. The interior of B H was a little on the trashy side...in fact we came across several cracker camps during the trip. You can always spot them...bear cans in the fire along with shot gun shells, a destroyed tent from Bass Pro and a chair or two usually with bullet holes in them. A Hammock clean up needs to be organized soon. New Easky Makes GA Coast Debut. We are pleased to announce the addition to our fleet of the new and improved Venture Easky. Although not the roughest and toughest boat out there, the Easky paddles like a dream. The seat is comfier and much improved, with the ability to add lower back support with the flick of the wrist. The Skegs and rudders have been redesigned and are also a big step in the right direction. You'll recognise them when you seem them ...bright green like Granny Smith. It's great to be able to offer our clients the latest and best gear on the market today. The new P&H Scorpio, the replacement for the plastic Capella, will be here soon. 15 of these pylons were totally shredded as well as two homes completely obliterated. Tornado Pulls Plug on Savannah Big Bash. The biggest collective hang-over of the year did not happen this Sunday morning in Savannah. Last night the lights went out and the music fell silent out about 11pm. And with nothing left to do, everybody went home early. . So what happened to cause such a drastic change in everybody's party schedule. Well, a mighty tornado touched down on the north bank of Ebenezer creek and followed the power cables that feed all of Savannah and surrounding areas. 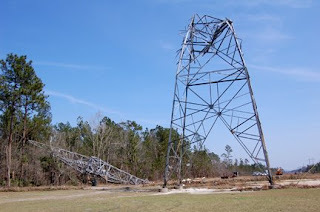 Fifteen huge steel Pylons were twisted and mangled beyond all recognition. Dozens of trees were uprooted and snapped mid way up. You could smell the tree sap in the air. 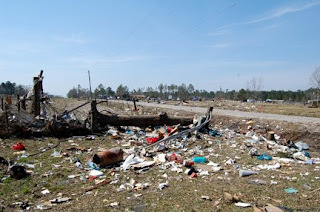 Two homes were completely destroyed and the residents of newly developed communities on Ebenezer road thought there last moments on earth had come. We ran a trip down the Ebenezer creek this morning and were treated to a terrifying scene of incredible destruction. I had no idea how far we would be able to get down the creek. There were trees down at the put in and a little further down, a dozen or so Cypress trees snapped off mid way up, but aside from a few tricky strainers, the waters flowed free. Amazingly, there was not a lot of damage in the creek valley. Pictures coming soon. The Surfing Swami stopped by yesterday for our first open house. 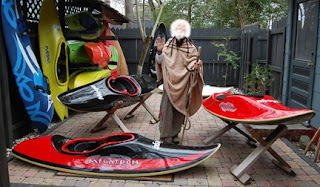 He did not stay long, but he did approvingly pass his third eye over the latest editions to our collection of Mega Kayaks. So moved was he, the shredding saint offered to make puga. And by some good stroke of karma, Kristin remembered the coconut at the back of the fridge. After some oming and aarghing, the Surfananda loaded his chillum and went off into semi-transcendental state, at which point the sparks were really flying. The loser monk then gave us a few techniques for better living and hence, better surfing. We did not see him leave. A long and hard winter it was not. Quite short and mild actually, during which we 'put up' our paddles and closed our doors. Did we lay on Sri Lankan beaches, sipping tea and sketching palapa huts and native canoes ? Did the howl of monkey madness in palm canopies serenade our western ears ? Did the dusky morning smell of burning coconuts and boiling chai infatuate our nostrils ? No, nothing like that happened. But we did get some rest and 'rest is best' said the fat guru. A lot of our attention turns to the house and garden which gets somewhat neglected during the 'season'. A trip to England, a stroll along Brighton prom and cup of tea behind the rain lashed windows of the Greasy Spoon cafe was as 'foreign' as we got. But, March is the start and we are now up and running, firing on all(most)pistons and excited about the paddling ahead. New boats from P&H will be here very soon and the Mega boat inventory is looking decidedly hot. We are implementing extended 'shop' hours...Thursday 6-8pm every week will be open house. Some evenings there will be lectures, slide shows and special presentations, but always tea and biscuits. Come over and say 'hi', maybe buy a new kayak... use the side gate and be nice to Joey. Savannah's Paddy's day parade is next Friday (March14) and symbolically marks the end of winter. I'd rather be in Santa Cruz and Kristin in Egypt. So we'll settle for Little Tybee then. We have a lot of plans for this season that will slowly be revealed, if not cancelled...so check back. And remember ...it's better with Metta. This is an ad we made. Some one thought it a good Super Bowl commercial Unfortunately the advertising rates were quite high so we just aired it on UTube. Our video department have now scraped enough money together to buy a video camera.